Welcome to Times of India Newspaper Ad Booking Portal. Use this portal to book any Newspaper Ad instantly online for Matrimonial, Property, Recruitment, Public Notice at the lowest rates. Pay via Credit Cards, Debit Cards, UPI, Net Banking or Cheque. Q. I want to place a Name Change advert in the Times of India. Are documents compulsory? Q. If I live in Dubai, how do I pay for the Name Change ad that I want to book in the Times of India Newspaper Mumbai edition? Do I need to use an Indian credit card or is a local international card okay to use? Q. I want to book an announcement advertisement in The Bangalore edition of Times of India. 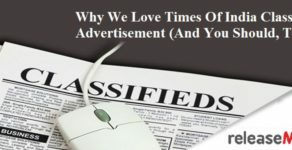 Which newspaper advertising agency can help me to book the text classified ad? Why advertise in Times of India Newspaper ? WHY ADVERTISE IN Times of India NEWSPAPER? Times of India has an extensive reach that covers newspaper advertising in over 35 metropolitan cities and towns. You can access our location specific ad rates simply by clicking on the city name under the AD RATES tab. Booking your ad in TOI means you spend lesser. Now publish your newspaper advertisement with low cost of Advertising , latest discounts and exciting packages easily and online via releaseMyAd. With a wide range of category specific supplements like Times Ascent for recruitment ads; Times Obituary; Education Times for all education related announcements or notices;Business by Bids to fulfil your trade requirements;Times Property for all your real estate campaigns;Times Zigwheels for buying and selling of all kinds of vehicles and lastly City Times which is the most popular source for news on travel,food,fashion and all page3 knowledge, Times of India is a highly result Driven Ad platform. Printed in over 50 editions and having circulation exceeding 32 Lakh copies daily, TOI newspaper advertisement displays a high brand equity. Booking your advertisement in Times of India allows you to access its innovating advertising solutions in the form of simple text ads in running lines with customizable formatting or display ads that can be published in various sizes and forms. releaseMyAd helps you create your unique advertisement in a few simple steps. To know more see our category specific sample Times of India classified ads. HOW TO BOOK AD IN Times of India NEWSPAPER? On successful payment, you’ll receive an invoice confirming your Times of India ad booking and payment details. Your Times newspaper ad is ready to be published on the specified date(s) once it passes through the editorial approval policies of Times of India. Classifieds Ad Sections LocationsFAQ Why TOI?